There are many places in Europe that are ideal for spending a perfect weekend and Budapest is definitely one of them. Budapest is the city with the historic cafes, the yellow trams, the cobbled narrow streets that boast freshly baked strudel and the oldest metro in Europe. The Hungarian capital is in fact two cities, Buda and Pest, which are separated by the Danube River and officially became a city in the late 19th century. Buda is tranquil, peaceful and green, with elegant architecture and few tourists, while Pest is vibrant and is the heart of the city, the center of culture and nightlife. The Hungarian Parliament is a neo-Gothic building of the 19th century inspired by the London Parliament located on the banks of the Danube. The Parliament was built between 1885 and 1902 and at that time it was the largest in the world. The building consists of 691 halls while the stairs are 20 kilometers long. Near the Parliament building along the Danube you will find a very special sculpture called Danube shoes. 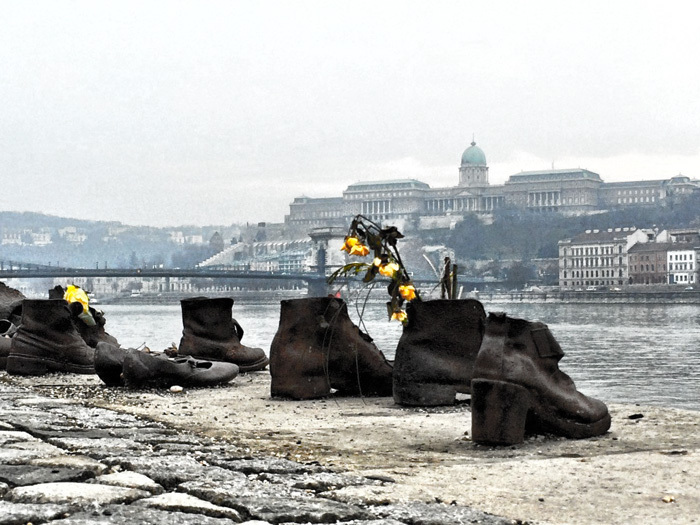 This particular monument is inspired by the Jewish inhabitants of Budapest, who during the Second World War were executed along the river after they were forced to take off their shoes. Heroes Square (Hősök tere), is a huge and beautiful square surrounded by important monuments. In the center of the square dominates the Millennium Monument, built between 1896 and 1900, features the statues of all the famous Hungarian men. In Hungary, the millennium refers to the year 1896, which marks 1,000 years since the birth of Hungary when the Hungarian tribes entered and occupied the Carpathian region. It took over 50 years and 3 different architects to build the largest church in Hungary. The interior of the church is very impressive, since the most famous sculptors of Hungary were invited to decorate it, who used 50 different types of marble. Also the right hand of Saint Stephen is kept here. You do not need me to tell you to take a break from your tours to enjoy a coffee. 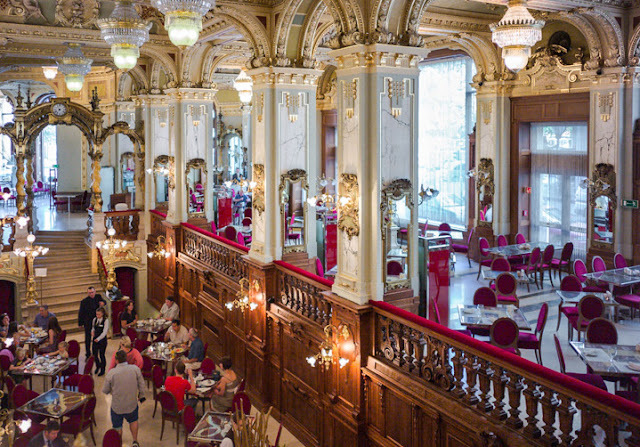 But because we are talking about Budapest, a city with many fine historical cafes, which travels you back to time, in the atmosphere of "old Budapest", I want to be sure you will! The most famous café in the city is the New York Café, which hosted many of the best writers and poets of the 20th-century. The legend says that the writer Ferenc Molnár wanted to keep the cafe open all day long, so he threw the key to the Danube. Undoubtedly, the chain bridge is the most beautiful and busy bridge in Budapest, with a pair of stone lions standing guard on every side of the Danube. 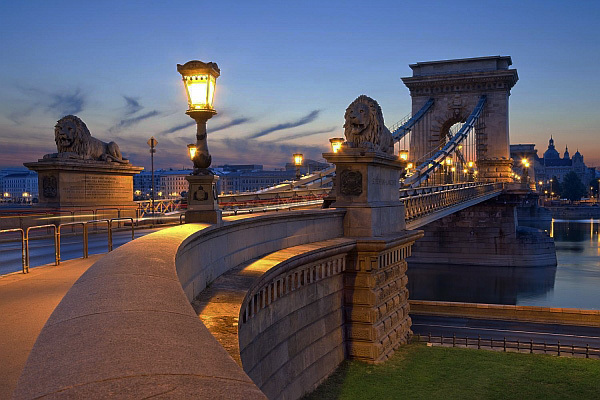 It is the first bridge that united Buda and Pest and dates back to 1849. Today's bridge though is much newer, since the original was exploded during the Second World War. As its name suggests, House of Terror is not an ordinary museum. This museum contains exhibits from 20th century fascist and communist regimes in Hungary and is also a memorial to the victims of these regimes, including those held, interrogated, tortured or killed in the particular building. One of the most distinctive features of the museum is the elevator that takes you to the basement where the detention and torture cells were located. The Széchenyi Baths are Budapest's most famous spa baths. Even if you have never heard of their name, you have certainly seen pictures of people who relax or play chess in the blue waters of the baths surrounded by beautiful yellow buildings. 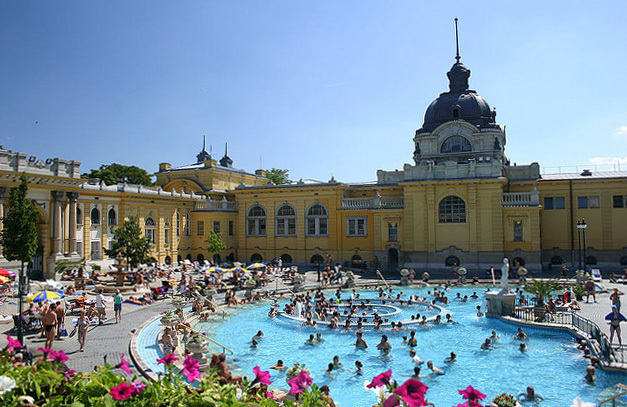 The Széchenyi baths functioned for the first time in 1913 and are the largest in Europe. There are of course many opinions on whether they are the best baths in Budapest or not, but surely there are dozens of baths in town, so you have a lot of choices. Budapest's central market is close to the Liberty Bridge and is a place that both locals and tourists love. It is the perfect place to see, taste and buy traditional Hungarian products such as dried peppers, sausages and paprika. Do not forget to take a stroll upstairs to buy some souvenirs. One of the most important attractions on the Buda side is the castle. It is built on a hill, which rises 48 meters above the Danube. At that very moment the city of Budapest was founded. 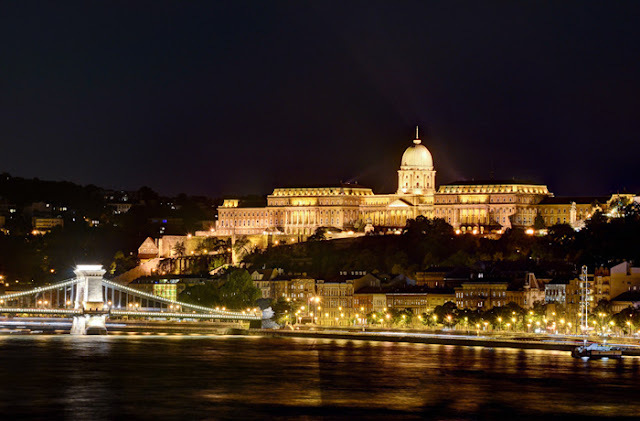 The Castle has 203 rooms and today houses several museums, the most important of which are the Budapest History Museum as well as the National Gallery. In the area of the castle, you will also find Fisherman's Bastion, which seems to have come out of a fairy tale. It was built in 1905 and consists of 7 towers that symbolize the 7 tribes of the Magyars who came to Hungary in 1896. It was named Fisherman's Bastion because in the past in this point was located the fish market of the city. It is no doubt the point from where you will enjoy the most beautiful views of Pest. 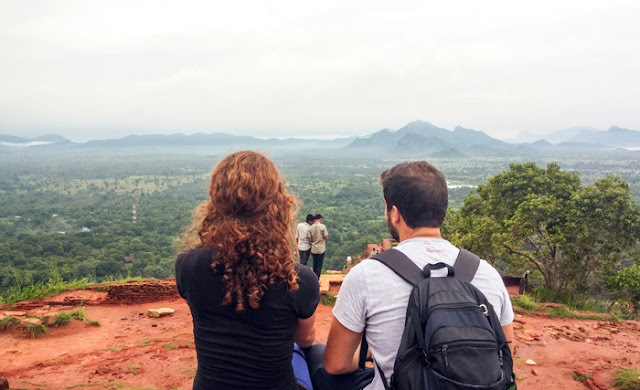 Margaret Island is a small paradise, just few minutes away from the city center. It is a tiny island on the Danube, which in the past was called the Island of Rabbits and was the place where the members of the royal family used to hunt. It has now been transformed into a lovely green park with beautiful gardens where you can also find the ruins of an old Franciscan church and a musical fountain.